Following our recent interview, Bruce Arnold was kind enough to share a couple of videos from his Trio showcase at the Gibson Showroom NYC. These two tracks, 12 Tone Boogie and Multiplicity are from his CD Heavy Mental. Check out Bruce's interview here. I recently had the opportunity to catch up with New York-based jazz guitarist Bruce Arnold via this email interview. Although not quite yet a household name, Bruce has played with musicians as diverse as Stuart Hamm, Peter Erskine, Joe Pass, Joe Lovano, Randy Brecker, Lennie Pickett, Stanley Clarke, and even the Boston Symphony Orchestra. As well as being a composer and prolific author -- he has written more than a hundred music instruction books -- Bruce is also the Director of the New York University Summer Guitar Intensive. He has also taught at prestigious music schools such as the New England Conservatory of Music, Princeton University, Dartmouth College, Berklee College of Music, New School University, and City College of New York. The Guitar Column: In addition to performing and recording, you're also deeply devoted to music education. 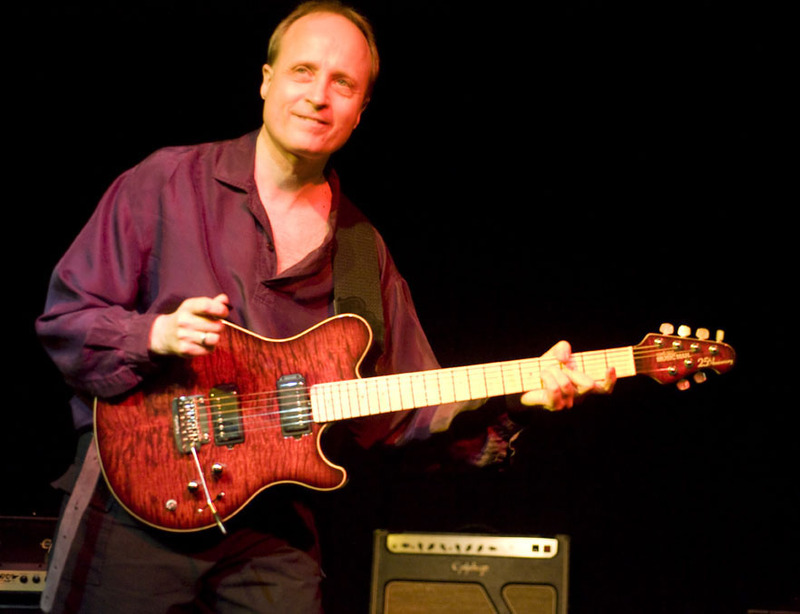 What is the state of jazz guitar education nowadays? How has YouTube affected things? Bruce Arnold: I think YouTube in general has been good for guitar education. There are so many categories of students out there and YouTube provides a place for students of all levels, all genres and all degrees of seriousness to join in on the fun of playing the guitar. YouTube also gives students access to videos of all kinds of guitarists in performance, so they can evaluate what a player brings to the table and check out how certain techniques are executed. One of its drawbacks though, is that anyone, qualified or not, can get on YouTube and 'teach'. In some cases this generates some misleading, and sometimes damaging information. If students would only approach the guitar like they approach their health they would be much better off in the long run. I mean, if you broke your leg would you rather go see a doctor or go to YouTube? So I get upset when I see people teaching things the wrong way and I feel sorry for those students who will practice something incorrectly and then have to unlearn it later. TGC: Describe the jazz guitar course you teach at New York University. BA: During the NYU Summer Guitar Intensive I teach two courses: Approach Note Theory and Set Theory for Improvisation and Composition. Approach Note Theory covers the use of chromatic passing tones and the numerous ways this style of playing has manifested itself and the future possibilities of its uses. This covers Bebop and post Bebop applications and includes many advanced concepts commonly used by today's improvisers. Set Theory for Improvisation and Composition looks at organizing sound in a much more logical way using Pitch Class Theory and the various ways it can be applied. I've written a book called Sonic Resource Guide which the students use to look at various relationships found in music. For instance this book contains all possible scales and which chords could be used over all those scales. It also contains all possible three and four note chords that can be derived from any scale. There are also lists of all possible hexatonic 3 note divisions possible for any 6 or 7 note scale. In a nutshell, it's a resource book that allows a musician to see the internal possibilities of any group of notes and then use these possibilities in playing. Students are very excited about this course because it allows them to see at least some of the possibilities of future sound combinations. I also play a lot of my music, demonstrating how to apply this information to jazz standards. This also clarifies things for the students a lot. TGC: What is a typical one-to-one lesson like at NYU? What are some of the things you work on with your students? BA: I initially put all students through a number of tests to evaluate their skills and the places they need improvement. Then I assign a different practice regimen to each student based on that assessment. There are things I always stress, though; I work with ear training which is great for connecting what they hear in their head to what they play on their instrument. I also spend time on things like time, rhythm, sight reading and more advanced concepts such as Pitch Class Theory. TGC: Most guitar players start getting into jazz after coming from a rock background. Assuming that such a person gets their melodic minor, harmonic minor and diminished scales and arpeggios together pretty quickly, what would you have them do next, to get their jazz sound together? BA: I tell students that scales are just one possible way to improvise. Jazz actually employes many other types of soloing ideas besides scales; for instance arpeggios, approach notes, other non 7-note scales which are organized in unique ways like octatonic scales divided into two groups of four notes, Hexatonic scales divided into 2 groups of three notes...I could go on. Then there's harmonic and chord tones and available tension reharmonization...and of course, rhythm, learning all your basic rhythms along with rhythms that combine notes, rests and ties. Then there's superimposition of rhythm and rhythmic transformations within a piece of music. Phrasing is also another important issue. And finally there is also ear training, which considering the possible complexities that can be found in jazz requires a student to develop an acute sense of pitch recognition. I've written books covering all of these aspects of playing music. Overall my teaching method isn't style based, it is musicianship based, so I have all styles of guitarists studying these various topics with me and applying them to all styles of music. TGC: What other musical philosophies do you pass on to your students? BA: I teach my students to hear music the same way they think of it. It is so common for students of guitar to find shortcuts that in the long run make them less musical. For instance if you think of an altered scale as playing a jazz minor starting from the 7th. i.e. a B altered scale is a C jazz minor scale, then you are really missing the boat. If you are going to think about playing music you should use your ear to tell you how you are hearing any specific musical situation and then think appropriately. If you had a B7 chord and you were hearing that B7 chord as the key center then you should think of the B Altered scale in B, not C. If you are not in the key of C, why are you thinking of C? It's very unmusical. Once we get that straightened out, then it's getting the student to the point that they aren't thinking at all, but just reacting. This gets much easier to do once we fix that first problem. 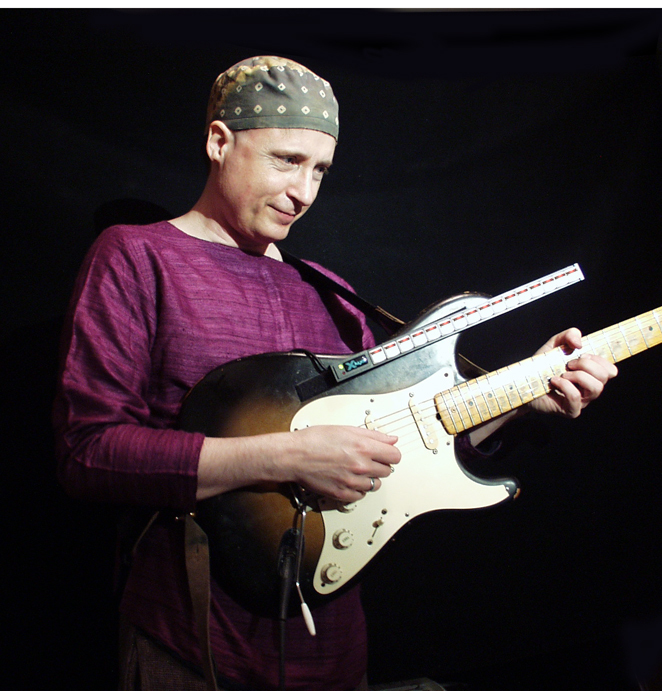 TGC: There seems to be a new jazz language developing on the guitar in the hands of players like yourself, Kurt Rosenwinkle, Ben Monder and Mordy Ferber. From your point of view is it an evolution of bebop or is an entirely new language being developed? BA: I think it is the latter. I've often said that rock follows jazz and jazz follows classical. Many of the techniques that the aforementioned players are using in their improvisation and composition come from the classical musicians of the 20th century. For myself, the use of Pitch Class Theory and the idea of making your soloing more connected to the composition have been a main driving force. Having one improvisational language that you then play over everything with no regard for the compositional aspects of the tune strikes me as very dated. When I write a composition and it uses let's say, a half step and a minor 3rd as its organizational factors, when I solo I feel I should also use this same idea in my soloing. Check out my CD 'Art of the Blues' for a great example of this, or any of my work with the band Spooky Actions, where I use this approach whether I am working with Early Music or Schoenberg. TGC: How can a student interested in this modern way of playing get a handle on it? Could you describe some of the approaches involved? 2. MY MUSIC: Explorations in the Application of 12 Tone Techniques to Jazz Composition and Improvisation. TGC: Any bright shining sparks amongst your current group of students that we may not yet have heard of? BA: I always have a few students that shine. I also get students that aren't shining yet, but as they progress they get more serious and really take off. I think it's important to understand that becoming a renowned and respected musician is more about dedication and drive than talent. I've been teaching for over 30 years and seen it all. You can be very good at playing at a young age but have no drive. You could be technically proficient but lack soul and creativity. I could give you a hundred other combinations but really it's the whole package that goes into becoming a great musician. Then there is the difference between an entertainer and an artist and the rare breed that is both. So I don't feel right giving you a particular name of a student. They could play wonderfully but not have the drive to tackle the incredibly competitive world of the music scene. Or they might be a lackluster talent, but work like crazy and have a good business sense that sees them succeed in five years. You just never know. TGC: As an aspiring jazz student yourself once, who were some of your early influences, teachers and mentors? BA: My earliest influences were blues players like Johnny Winter and Duane Allman. When I went to Berklee College of Music I got into the straight ahead jazz players like Joe Pass and Wes Montgomery. But at the time, the local Boston scene also included Bill Frissell, Mike Stern and Pat Metheny. I loved and absorbed their music too. I was blessed to be at Berklee at a time when it attracted the Who's Who of guitar, and this made an immense impact on me. Besides my Berklee teachers I also studied with Charlie Banacos, Jerry Bergonzi and Mick Goodrick; for my money they are still the three pillars of modern music education. It was sad to hear of the passing of Charlie Banacos. He was a truly brilliant and caring teacher and a treasure house of information. TGC: What's the jazz scene like in NYC nowadays? Are there more or fewer jazz clubs than say 20 years ago and are there any live venues left for jam sessions? BA: The NYC scene varies a lot. Right now there are a lot more clubs opening in Brooklyn than Manhattan. There are very few musicians left actually living in Manhattan due to the exorbitant rents; most are in the outer boroughs, and so Brooklyn has a huge scene. There has always been a great tradition of sessions, and that continues regardless of venues, so it's not very hard to find absolutely phenomenal musicians that want to do sessions at someone's apartment or studio. TGC: This interview wouldn't be complete if I didn't ask the obligatory gear questions. Are you into effects pedals? BA: I use a Klon Centaur for distortion, Full Tone Clyde Wah and a Ground Control Midi Foot Controller or XKeys Stick to control patches inside SuperCollider. TGC: What is the SuperCollider? BA: SuperCollider is an object oriented programming language for real time audio synthesis and algorithmic composition. It was released in 2002 by its author, James McCartney. It is commonly used for acoustic research, algorithmic music and interactive programming. For a performing guitarist this means you could build any traditional guitar effect like reverb, delay, compression, pitch shift etc… or any synthesis like additive, subtractive, FM to enhance your guitar sound or as an addition to your guitar sound. It can also record, playback and manipulate prerecorded sounds including the traditional "loop" idea used by many guitarists. I could go on, but suffice it to say it can do just about anything you could think of when it comes to sound. With SuperCollider I create personal, unique sounds and the beauty part is that I just carry around a laptop rather than pounds of pedals. It also allows me to program new sounds anywhere whether I have a guitar strapped around my neck or not. So it's highly efficient and I commonly can be found programmming new sounds on a plane or train as I commute to gigs. TGC: I watched your Master Guitar Symposium dvd and you performed duets with your guest players entirely on a Fender Stratocaster. Your choice of a Stratocaster seems to be unusual for a jazz guitarist although you do get a really warm sound out of that instrument. Do you have it setup in a particular way? What pickups and strings do you use and why is there a strip of velcro running along the top of your guitar? Some tone enhancing secret perhaps? BA: I usually use the 2nd position between the neck and middle pickup and roll off the tone to about 4 or 5. I use Kinman pickups because they give you that vintage sound without noise. Strings are LaBella. The Velcro strip is for attaching my XKeys Stick which allows me to run SuperCollider presets from the guitar. I don't always use it, so you only see the strip in some of the photos. I also use midi foot controllers and many other devices. TGC: How did the idea for the Master Guitar Symposium dvds on Mel Bay come about? BA: Each July I direct the NYU Summer Guitar Intensive. We usually have around 45 clinicians that come to talk to the students and play a bit. The information they give is fantastic and Bill Bay at Mel Bay and I thought it would be a good idea to let people in on this great event through the DVDs. I had a ball hosting it and playing with all those great players. I highly recommend it to anyone who is serious about guitar. TGC: Mel Bay seems very dedicated to jazz guitar education. They seem to have a pretty wide selection of books and dvds on the the subject -- moreso it would seem than any other publisher. BA: Yes, Mel Bay is really dedicated to guitar education on all levels. They are also a great pleasure to work with. Bill Bay and Colin Bay are great people who sincerely want to provide the best guitar educational products possible. TGC: What are some of the current musical projects you're involved in? BA: I'm about to release a duet CD with Dave Schroeder aka Woodrow T. Greenwich on harmonica and myself, aka Arnett Brewster on lap slide guitar. The duo is called Great Houdini and is a CD of all original music. We call it Great Houdini because we both get to be "escape artists" from our usual roles as sax player and guitarist. I'm also currently recording a new Rock/Fusion CD with bassist Jerry DeVore and Kirk Driscoll on drums. This new CD only uses 025 in the compositions and improvisation. (025 being a major second and fourth.) I'm also starting to write new music for my jazz trio with Tony Moreno on drums and Dean Johnson on bass. Once again, I'm exploring the idea of superimposing time levels in my compositions and improvisation, as I did in "Art of the Blues." TGC: Could you talk about your books a bit? BA: I've written quite a few books to help musicians learn everything from the basics of music to learning and applying very advanced topics. The subjects include Composition, Music Theory, Scales, Chords, Ear Training, Rhythm and Time. You can find a complete list at http://muse-eek.com/ but I believe that learning music needs more guidance than just buying a book and working through the exercises. You need some personal guidance to make sure you are dealing with your weaknesses and practicing in a physically and mentally correct way. To help musicians in this area I do quite a bit of email correspondance, Skype lessons, along with some new projects coming out soon. I will be doing online lessons with Truefire's Guitar Sherpa starting in a few months as well as a more robust interface at http://muse-eek.com as soon as the new website is finished. I also have a music blog on my artist website http://brucearnold.com/ where I discuss many of the topics mentioned in this interview. TGC: How about leaving us with a memorable road/gig story from your experience as a jazz musician. BA: Living in NYC you can get recommended for some unusual gigs. About 10 years ago I was called on to work with a very serious classical group called the Absolute Ensemble. They were performing a piece called "Blood on the Floor" by Mark Anthony Turnage that called for a jazz section. Peter Epstien was on saxophone, Peter Erskine was on drums and yours truly on electric guitar. I was just in the middle of my SuperCollider explorations, and one night when it was my turn to solo, I just had this "aha" moment, and created an atmospheric sound collage, along with the notes. Maybe I was channelling Cage or Stockhousen. Afterwards, Erskine said it gave him goosebumps, and as it turned out, the composer was in the audience and he wrote to me singling out that solo as something he really liked. You might not think of that as a great jazz story, but really, the use of sounds as music has its own precedent in jazz as well as other kinds of music. I also felt this great clarity while I was playing, that I usually associate with a good solo. And I remember that solo more than the millions I've played, for those reasons. I recently got my hands on a copy of Blues Guitar Artistry by Matt Schofield. Published by Hal Leonard, this dvd gives us a glimpse into the creative process of one of blues guitar's rising stars. Choosing to present his material in the style of a guitar masterclass rather than your typical 'here's-lick-number-14'-type instructional video, Matt Schofield covers a variety of topics in a casual conversational style. And Schofield proves himself to be a modern blues master of the highest order. Backed by his 4-piece band, Schofield's emotive solos on the live performance sections are downright beautiful and worth the price of admission alone. Citing a video performance of BB King, Albert Collins and Stevie Ray Vaughan as the catalyst for his picking up the guitar, Schofield started jamming along with his father's collection of blues records. He states that he was never one to learn entire solos note-for-note, choosing instead to build his blues vocabulary through improvising and playing along with records, transcribing only the occasional lick or melodic idea. Nevertheless, he maintains that it is important to have a working knowledge of the blues tradition and language as it pertains to improvising over a 12-bar structure. In the Tone and Technique chapter of the dvd, Schofield treats us to some really cool licks that contain some very interesting but subtle inflections, one of which is a succession of descending raked triplets he uses to punctuate the ends of phrases. Tonally, the guitar simply purrs in his hands. Discussing his right-hand technique -- he plays with the rounded end of the pick, throwing in some fingerpicking to get certain notes to pop -- Schofield talks about pick angle and the technique he uses to getting notes to 'bloom'. If you're an advanced player, and you aren't already hip to this concept, you owe it to yourself to check out this chapter of the dvd! As Schofield says, "If you like a player's tone, you might be better off asking them how they hold a pick and what kind it is rather than what amp or pickups they use." Taking us through his personal guitar setup, Schofield talks about how he prefers it when he has to work the intrument. He feels this adds to the vibe of the music, and allows him to extract more tonal range out of the guitar. I should mention also that this dvd is completely devoid of any notation or tablature of any sort so you're pretty much on your own as far figuring out what Schofield is playing. This might be fine for the intermediate or advanced players who have mapped out their scales and fingerboard patterns. But most of the lines and ideas that Schofield demonstrates will more than likely go right over the heads of the novice player expecting to learn some hot licks note for note. The decision to omit any form of transcribed notation from this dvd is probably a reflection of Matt Schofield's own philosophy and approach to music. As he puts it, "Remember, your ears are your first instrument, so the bigger they are the better. Really listening to great music more deeply is one of the greatest things you can do for your own playing.. study everyone from Robert Johnson to Eric Johnson and all points in between"
I really hate to compare players of this calibre with the more established cats, but just as Joe Bonamassa digs quite heavily into Eric Johnson's bag, Schofield's Robben Ford influence is quite apparent. But he is thoughtful enough to fuse Robben's stylistic phrasing with the standard blues influences of BB and Albert King, Albert Collins and Stevie Ray Vaughan. Whereas Robben spices his blues playing with diminished and melodic minor ideas from the jazz realm, Schofield's approach is simpler while still giving him access to some of the more sophisticated inside-outside ideas. 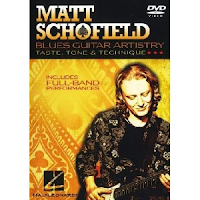 I'll leave you to check out the rest of the dvd where Matt Schofield thoroughly explains his harmonic concepts and how he uses them in both his comping and soloing. Definitely a must-buy for any serious student of modern blues guitar. RIP, Sir. You will forever be an inspiration.